Steven Spielberg seems to have gone back to his Indiana Jones days with The Adventures of Tintin. Even the soundtrack sounds similar to that of Raiders of the Lost Ark. (Of course, Tintin‘s music was composed by the same John Williams.) We just wish Spielberg would have stuck with an actual human cast like in Indy instead of the performance-capture-animated one he used in Tintin. Shot in the same style as The Polar Express and Mars Needs Moms, Tintin admittedly does look much better than those earlier movies. But this type of animation still comes across as creepy and unrelatable. It’s too real-looking to be enjoyed as an animated movie and too fake to be real. Instead, it’s a weird hybrid that leaves you noticing how the characters’ amazingly fluid movements don’t match their too-stiff lips when they talk, when you should just be enjoying the story. And, the use of such animation-movie tricks as, say, a man getting caught in a plane’s propellers and flying around the nose of the plane without breaking a bone just doesn’t work with this realistic style. The action defies physics too much for viewers to think it’s real and be scared for the safety of the character, and the characters and world are too real for us to buy that it fits within this animated world. The story, as we learn in the many making-of featurettes on the Blu-ray, is a combination of a number of tales from the original comic books by French author Herge . The mash-up was done by Spielberg and producer Peter Jackson (The Lord of the Rings) with the approval of Herge’s widow. Jackson came onto the movie when Spielberg asked Weta Digital to do a test for a digital version of Snowy. Spielberg admits that he had originally planned to do Tintin as a live-action movie, and the test, which is shown in the featurette, showed that a digital Snowy with a live actor would work beautifully. 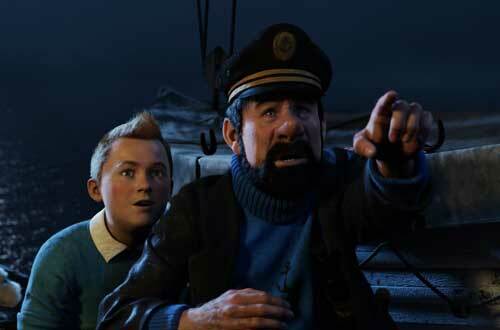 Jackson himself, a long-time Tintin fan, even appeared in the test as Captain Haddock. Unfortunately for us, the digital Snowy was so good, Spielberg decided to do the whole film with the same animation. Sigh. But Jackson joined Spielberg as producer and partner in the series, with Jackson planned as the director for a second Tintin film. The featurettes, 11 in all, are the only special features on the Blu-ray, but they’re so well done, we don’t need much more (hence our higher overall rating). Actors, including Daniel Craig (The Girl With the Dragon Tattoo), Simon Pegg (Mission: Impossible — Ghost Protocol), Nick Frost (Paul) and Jamie Bell (Retreat), as well as Spielberg, Jackson and designers for the film all appear in the segments, talking about their inspirations, creative decisions and more for all aspects of the production. We even learn about the original Tintin comic books (being French, Tintin should be pronounced as “Tantan”). The Blu-ray shows off the movie well. Despite the creepiness of the characters, the video is gorgeously rendered with stunningly rich colors. And Williams’ familiar score sounds brilliant in 7.1 audio. Oh, and about that Indiana Jones connection, it turns out that Spielberg’s introduction to Tintin was in 1981 when he was trying to read a French review of Raiders of the Lost Ark and the critic likened the movie to a Tintin story. Well, that explains it.